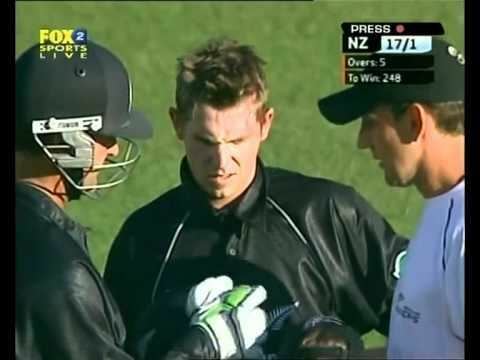 Michael Horatio William Papps (born 2 July 1979) is a New Zealand right-handed opening batsman and wicket-keeper. In October 2016, he became the first player to score 10,000 runs in the Plunket Shield. Papps made his first-class debut in the 1998-99 season for his local provincial club Canterbury Wizards, for which he would go on to make 6,663 runs, second most for an individual player for one province. He switched to Wellington Firebirds in July 2011 after twelves seasons with the Wizards. Papps is going to play for Burbage and Easton Royal Cricket Club in Wiltshire for the 2013 Wiltshire season. After a successful career in the junior teams, Papps was selected for the one-day series against South Africa in 2003–04 to solve New Zealand's long-running search for a capable opening batsman to partner Stephen Fleming. He made 59 on his debut but struggled with injuries afterwards. During a ODI against Australia in Auckland in early 2005, he was hit in the head twice by Brett Lee's bouncers. A subsequent scan ruled out brain injury but he never made another ODI appearance after the incident.